Snow in the mountains, clouds in the sky, brown trout are moving to streamers. Woolly Buggers and the hundreds of variations from this noble pattern dominate streamer fishing this time of year. Here are some other patterns that work that all play off the Woolly Bugger: JJ Specials, Yuk Bugs, my beloved Big Hole Crawler, Girdle Bugs, Woolly Worms and the Flying Ace. 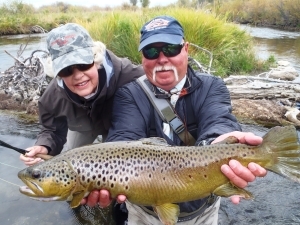 Pictured: Healing Waters Lodge guest, Anne and our guide Bart, holding the impressive Brown that she just caught.